Living in South Florida has a lot of perks. The beach is minutes away; flip flops are appropriate year round; I get to indulge my love of neon without being judged (you should see the looks you get when you wear Lilly Pulitzer in Colorado); we never have to shovel snow; life is generally sunny. And while all these things sound and are amazing, this can become a bit of an issue when the holiday season rolls around. It's very difficult to get in the mood for fall when it's 100 degrees out. You want to feel festive, wear your flannel shirt, bust out some boots maybe. But no. It's so hot your steering wheel is burning your hands as you're driving to Target to buy candy corn and Pumpkin Spice Oreos. How am I suppose to want to drink apple cider and hot chocolate when I am getting dehydrated just walking to the mail box? Let's carve a pumpkin in our bathing suits? It doesn't seem right does it? As a food blogger, we are suppose to be a season ahead. I know that I am way behind the rest of the online world when it comes to my fall recipes but I just couldn't do it. I feel like I should be making popsicles not pumpkin bars. The other day while looking over my Pinterest stats, I realized that an alarming number of people are already repinning my Christmas recipes. As in planning their holiday baking. Dear Lord, save us. It took me 20 minutes to find my favorite pair of jeans the other day because it had been so long since I last wore them (which by the way was in July on vacation in North Carolina, see what I mean?) . So I have learned to compromise when it comes to weather and the holidays. I wear a short sleeved dark colored dress on Thanksgiving; I buy Pumpkin Pie Ice Cream at Publix; I lay out while listening to Christmas carols. And I made these cookies. 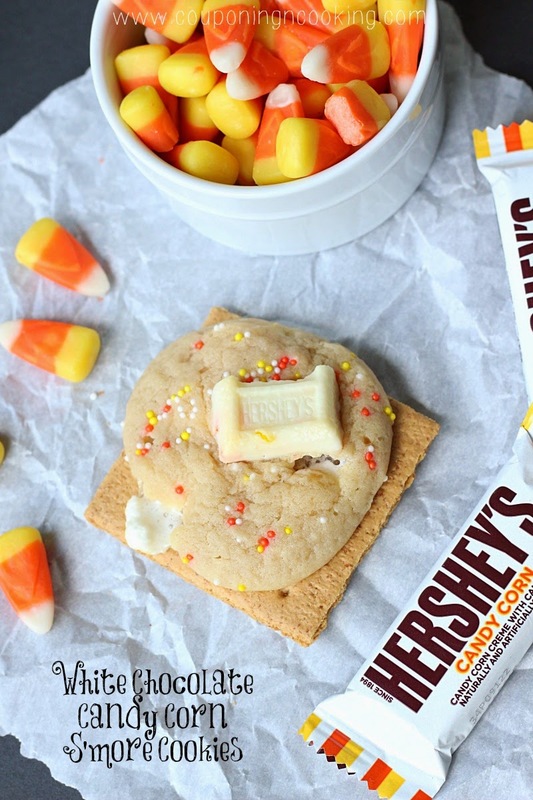 These White Chocolate Candy Corn S'mores Cookies are my way of compromising fall flavors with the eternal sunshine of my not so spotless kitchen. 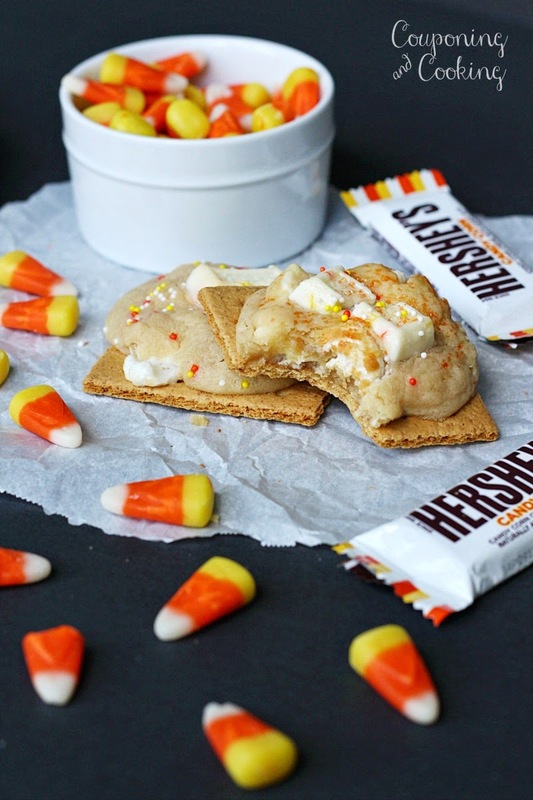 And while the weather here is always warm enough for s'mores, you cold weather dwellers can use these as a last ditch effort to hold onto summer. They were born from my need to buy every single season flavor of candy ever made. No really. I can't not buy them. Even if I know I will never make anything with them ever. I must get at least one bag just in case. And as I walked by the Hershey's Candy Corn Bars in Target I instinctively reached out and grabbed a bag without thinking and dropped it in my cart. 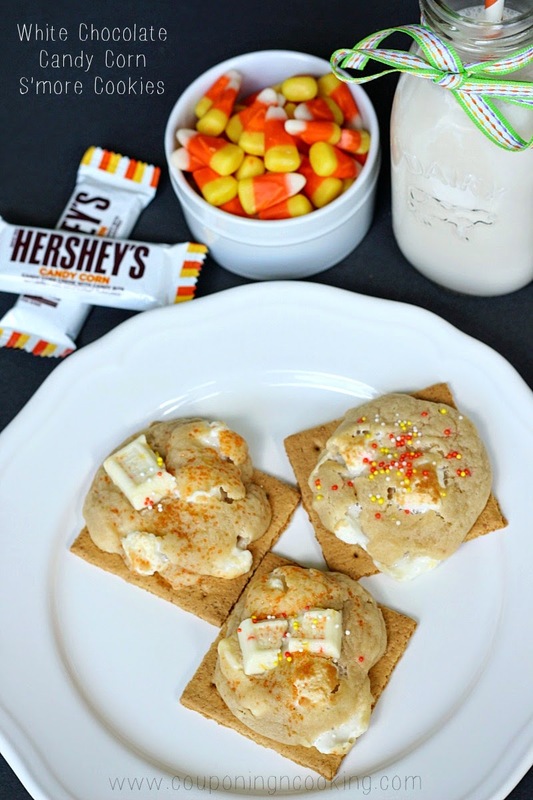 Then as I imagined what they might look like I had a recipe flashback right there in the Halloween aisle and I realized that they would be the perfect thing to recreate my favorite Chocolate Chip S'more Cookies. It was like divine recipe inspiration. I literally stood in the middle of Target and planned out the recipe and then went straight home and made it. And it was just as amazing as I thought it would be. 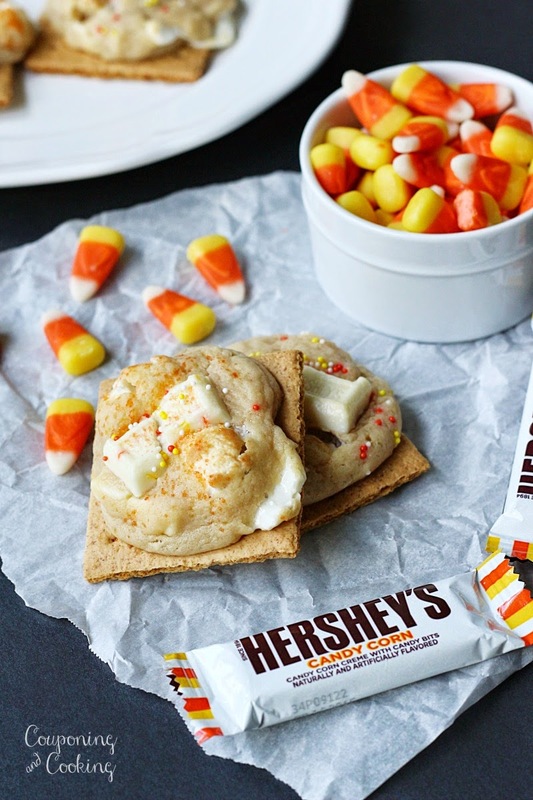 Well actually it was better because, honestly, I can't say that my expectations for a candy corn/s'more combo were that high. But I was wrong. So wrong. This is one of those desserts that is so wrong it's actually right. Sort of like swimming on Christmas Eve. 1.) Cream together butter and brown sugar. 2.) Beat in eggs and vanilla. 3.) Stir (do not beat!) in the rest of the ingredients. 4.) On a lined baking sheet, place halves of graham crackers about an inch apart. 5.) 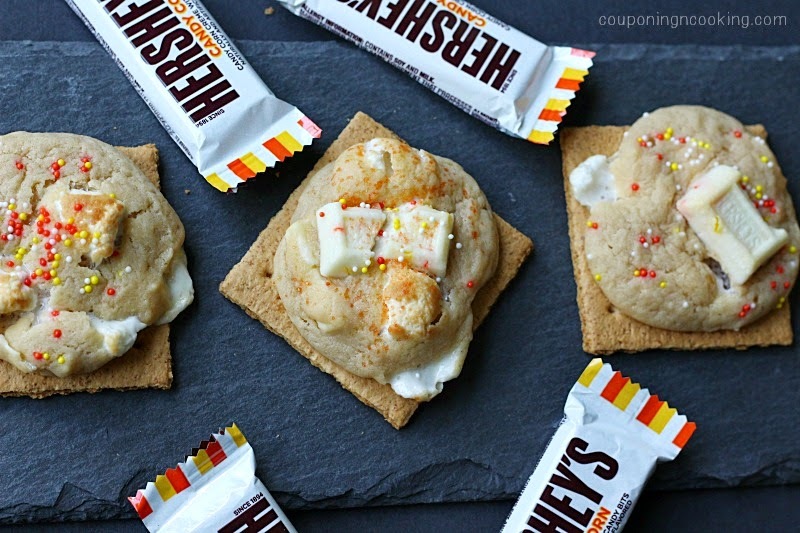 Place a ball/scoop of dough in the center of each graham cracker. I used my OXO Good Grips Medium Cookie Scoop. 6.) Bake at 350 degrees for 10 minutes. Don't do more than that even if they don't look done. The crackers will burn and break. The dough might still look "wet" but it look perfect once they cool. 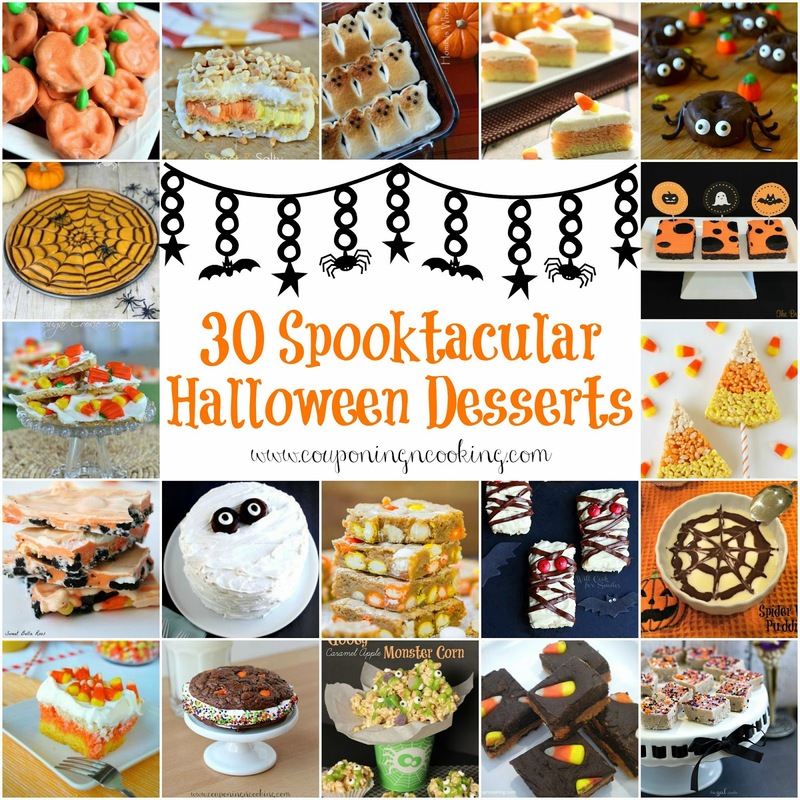 Check out my Halloween Pinterest Board! Zaycon Chicken Event: $1.89 a pound!